This story originally appeared in our June 2018 issue and will be followed by a list of the largest projects currently underway in Saudi Arabia. When work on the Kingdom Tower by architects Adrian Smith Gordon Gill (ASGG) is completed in 2020 in Jeddah, Saudi Arabia, its elevators will bring visitors up to the building’s highest residential floors 114 stories up in roughly 52 seconds, where views will stretch out over the Red Sea and beyond. The trip, dizzying as it might sound, is symbolic of the speed at which Saudi Arabia is embracing new globalized perspectives as it seeks to pivot away from oil and toward a diverse, sustainable economy via its Saudi Vision 2030 plan, an initiative that seeks to crystallize this transformation. United States Commerce Secretary Wilbur Ross recently touted the efforts at an economic summit, saying, “We’re standing with [the Saudis] as they’re about to transform both their society and their economy. This new move I think could be even more dramatic and more far-reaching for the whole geopolitical sector than was the original hydrocarbon.” He means it could be more transformative than oil. The nation has been undergoing change for some time now, as it embarks on the early stages of fulfilling the dream of its recently-deceased monarch—King Abdullah bin Abdulaziz Al Saud passed away in 2015—who sought to re-open Saudi Arabia to the rest of the world after a period of relative isolation. Abdullah’s initial plans involved developing several economic development zones that function outside of domestic norms and laws. These new areas aim to make the Kingdom a node for global finance between the Middle East, Africa, and Asia, seek to spur innovation at home with investments in universities, and look to boost appeal among tourists and pilgrims to its many religious and cultural sites. The effort has continued under the new king—Salman bin Abdulaziz Al Saud—and the heir apparent Crown Prince Mohammed bin Salman (MBS), who are enacting further reforms under the mantle of their Saudi Vision 2030 program. The many changes are due to necessity more than anything else—over 70 percent of the Saudi population is less than 30 years old—while job and housing prospects for this group are anemic under the existing models. To boot, over 200,000 Saudis are currently earning professional and academic degrees abroad and will eventually join ascendant Saudi millennials in demanding steady, well-paying jobs (and relaxed social mores) that the oil economy simply will not be able to provide. The National Transformation Program, part of Vision 2030, calls for creating more than 450,000 new jobs for Saudis by 2020, increasing the private sector’s contribution to the national GDP, and boosting housing production and incentivizing housing affordability across the country. New cities and neighborhoods will be developed to meet this need, with Saudi authorities expecting to spend more than $78 billion on Vision 2030 initiatives between 2016 and 2020 alone. The new cities, infrastructure, and urban monuments that result will embody the manifold economic reforms the state wishes to embrace as it moves forward. Vision 2030 seeks to add no fewer than five new megacities and many smaller developments to the country over the next decade or so. 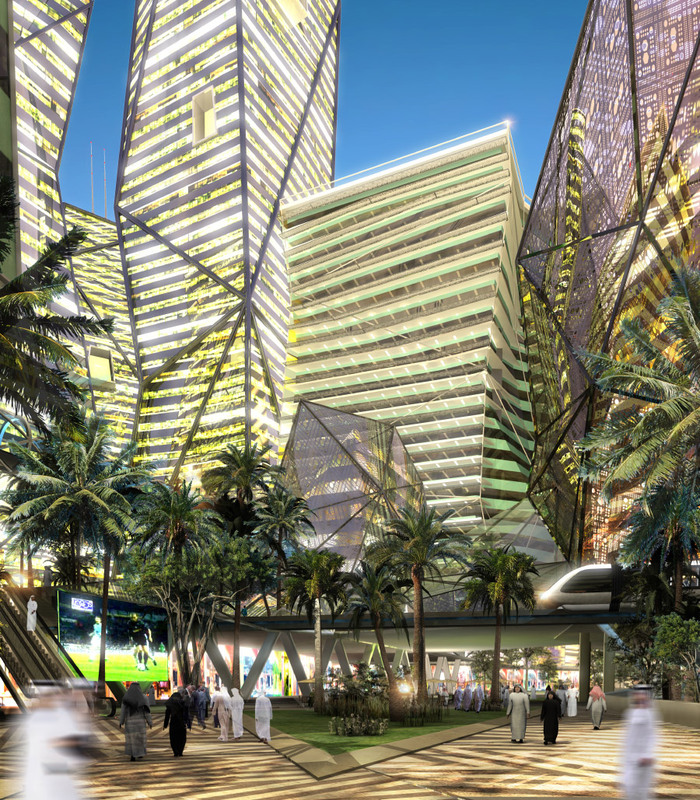 These large and multifaceted developments, generally speaking, will be designed to have regionally specific industrial focuses like global finance, agribusiness, and religious tourism, and will be connected via new transportation investments like high-speed rail on the west coast and an upgraded central airport in the capital city of Riyadh and the country’s second largest city, Jeddah. The result, should it come to pass, will be one of massive change embodied by glimmering, faceted towers, cul-de-sac-bound streets, and tightly packed townhouses. As new reforms take off, and earlier experiments come online, questions on the nature of the coming changes abound. Is the sacrifice of historic and natural sites in the name of progress worthwhile? Will the reforms stave off social unrest in the future? 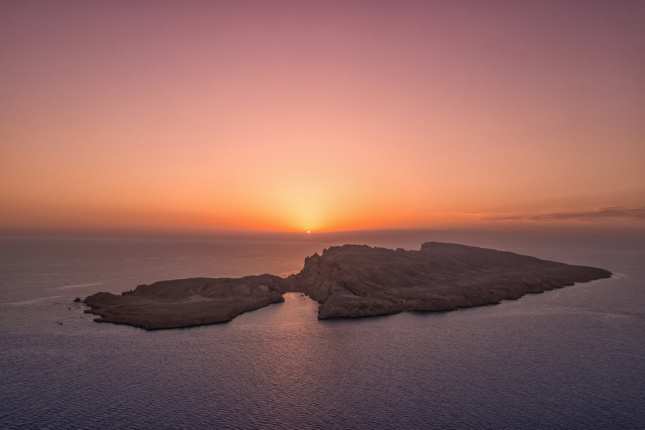 A recently announced plan calls for the creation of a new multinational economic area called NEOM, a 10,230-square-mile purpose-built city (nearly 34 times larger in area than New York City) planned on the edge of the Red Sea. The megacity, focused on energy, water, biotechnology, and food production, is expected to cost $500 billion and will be jointly developed with Egypt, Jordan, and Israel, all of which share borders or Red Sea access with the development. Although an official master plan for the region has not been unveiled, a design document prepared for the area calls for “opulent buildings with modern and traditional Moroccan-style architecture.” Like other forthcoming economic zones, NEOM will be designed with judicial and governing bodies that exist outside traditional Saudi governmental structures, a bid to leapfrog over incremental reforms and develop globalization-friendly areas that are attractive to young Saudis, international investors, and tourists. 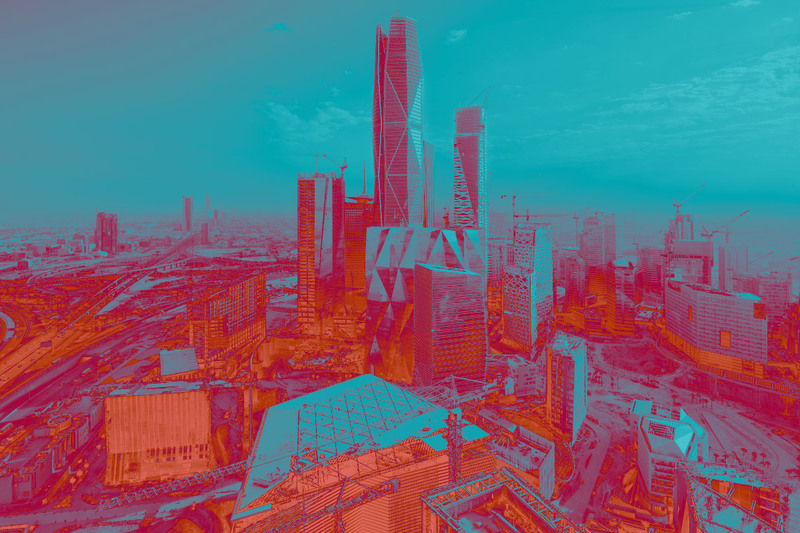 At least four other economic zones were planned prior to MBS’s tenure, including the King Abdullah Financial District (KAFD), a 17.2-million-square-foot development master planned by Danish architects Henning Larsen on the northern edge of Riyadh. After lengthy delays, the leaf-shaped business district will be complete later this year. According to Henning Larsen, the district is planned in tightly grouped clusters of high-rise office and residential towers that are organized to mitigate solar heat gain. The faceted towers connect via networks of elevated skyways and will frame lively pedestrian zones along lower levels inspired by the region’s seasonal wadi riparian landscapes. Here, pedestrians will find shelter from the crippling heat while infrastructural elements capture and recycle runoff and rainwater. Overhead trams will provide further shade while the buildings’ varied geometries deflect direct sunlight. The firm studied the site’s solar and wind patterns intensely in order to generate a development envelope and site plan for KAFD that work together to bring down ambient temperatures by as much as ten degrees. KAFD will be connected to the rest of the city by a new metro system—one of many ground-up transit systems being built across the country—that will include six transit lines with 85 stations and 110 miles of track. The system is being developed by Bechtel, Siemens, Alstom, and Samsung, while station design is being undertaken by international architecture offices, including Zaha Hadid Architects (ZHA) and Snøhetta. At the center of the citadel will be HOK’s Central Market Authority Tower. Developed with Saudi architects Omrania, the 76-story office building will feature triangulated exterior walls wrapped in an outward layer of horizontal fins and perforated metal panels. The highly articulated building will be joined by 58 other skyscrapers designed by various international firms, including SOM, CallisonRTKL, Gensler, Foster + Partners, and others. Another new economic zone is the King Abdullah Economic City (KAEC) outside of Jeddah on the Red Sea coast. The 65-square-mile development is master planned by a consortium led by SOM and BuroHappold and is billed as “a new world city for Saudi Arabia” that will take the country “far beyond the oil-based economy,” according to Fahd Al-Rasheed, managing director and CEO of KAEC. The new megacity will ultimately house two million residents and is located near the major cities of Mecca, Medina, and Jeddah. 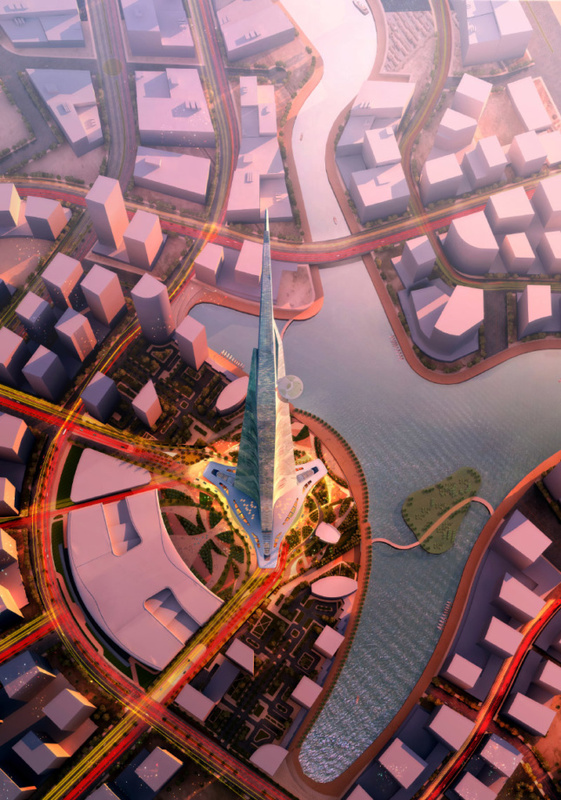 Carved into successive coastal, industrial, port, and business zones, the district will include the aforementioned Jeddah Tower by ASGG, which is currently under construction in the city’s “financial island,” a central business district. The nearby King Abdullah University of Science & Technology, also by HOK, opened in 2009 as the kingdom’s first co-ed university. The two nodes will sit at the nexus of the Haramain HSR line connecting Medina in the north with KAEC, Jeddah, and Mecca to the south. The rail line will feature stations designed by Foster + Partners and BuroHappold that are meant to act as large-scale welcome portals to each city. Each station is unique to its locale, but all present cavernous, 85-foot-tall arched interior volumes with intricate structural detailing. The stations, designed to strategically avoid direct solar glare and filled with wide-ranging functions, will also create accessible pedestrian zones at each stop, allowing travelers to seamlessly arrive into town car-free. When the 280-mile-long HSR line opens sometime this year, it will effectively create a contiguous urban spine along Saudi Arabia’s west coast with economic, educational, civic, and religious nodes. Two other economic cities are in the works, including the Knowledge Economic City (KEC) outside of Medina that will focus on intellectual property, knowledge-based industries, and medical, hospitality, tourism, and multimedia endeavors. The development is planned by AECOM as a residential hub and will offer housing for 150,000 Saudis across four distinct neighborhoods populated by apartment blocks, townhouses, and detached homes. The city will aim to provide roughly 20,000 jobs and is planned to contain large shopping and commercial areas. KEC is currently under development and is expected to be finished in 2025—five years later than originally anticipated. Smaller satellite cities across the country, anchored by cultural, academic, or economic institutions—like ZHA’s King Abdullah Petroleum Studies and Research Center (KAPSARC) in Riyadh—are also in development. The energy- and technology-focused think tank headquarters and cultural center is envisaged as a cluster of courtyard pods. The building is joined nearby by the KAPSARC Community, a new 200-home sustainable neighborhood by HOK. The 500-acre development features umbrella-shaded community spaces, a spiritual district, and neat rows of geometric, off-white villas. HOK is also at work on a similar arts-focused community located beside Snøhetta’s King Abdulaziz Centre for World Culture (KACWC) in Dhahran. Snøhetta’s pebble-shaped cultural center contains an auditorium, a cinema, a library, and a museum, among other services, all spread out across a stack of bulbous, metal-tube-wrapped volumes. In creating a complementary residential component to KACWC, design principal Roger Schwabacher and his team at HOK aimed to “create a place to celebrate traditional Saudi craft that also doubles as a next-generation incubator space” for Saudi creatives, Schwabacher said. In the city of Mecca, however, development is moving too quickly for some. Mecca is the Holiest City in Islam and hosts over 2.4 million pilgrims during the 2017 Hajj and Umrah annual pilgrimages. Efforts are underway to expand that number to north of 17 million pilgrims in coming decades, a prospect that has resulted in many renovations and large new public and private works. Recent hotel expansions, in particular, have led to the loss of much of the historic fabric surrounding the Great Mosque at the center of the city. In 2013, for example, the house of Muhammad’s first wife, Khadījah bint Khuwaylid, was torn down and replaced with a new public bathroom facility intended to handle the increased visitors. The loss, one of several high-profile demolitions in recent years, angered many and brought into question the lengths Saudi officials are taking to solidify tourism as an economic force in the country. Other high-profile improvements include the addition of wheelchair-accessible viewing ramps to the Great Mosque, as well as a forthcoming expansion of the Great Mosque’s worship spaces that will double capacity to 1.2 million worshipers. All of these changes can now be seen from the city’s tallest spire, the Abraj Al Bait tower, by German architecture firm SL Rasch GmbH. The 1,972-foot-tall Big Ben–like structure is rooted in a cluster of midrise hotel and shopping mall towers and was completed in 2011, ushering in a wave of high-rise development directly beside the Great Mosque. The massive clock-tower-topped complex is now joined by the multiphase Jabal al Kaaba hotel, an even more tightly packed cluster of mixed-use towers containing a total of 8,500 hotel rooms. The projects will soon be joined by additional developments by Foster + Partners, HOK, and other international offices. The Foster + Partners project, for example, will bring a crystalline bundle of hotel and apartment towers conceived under a philosophy of “luxury with humility,” marketing speak meant to attract wealthy pilgrims to the new high-end residences. 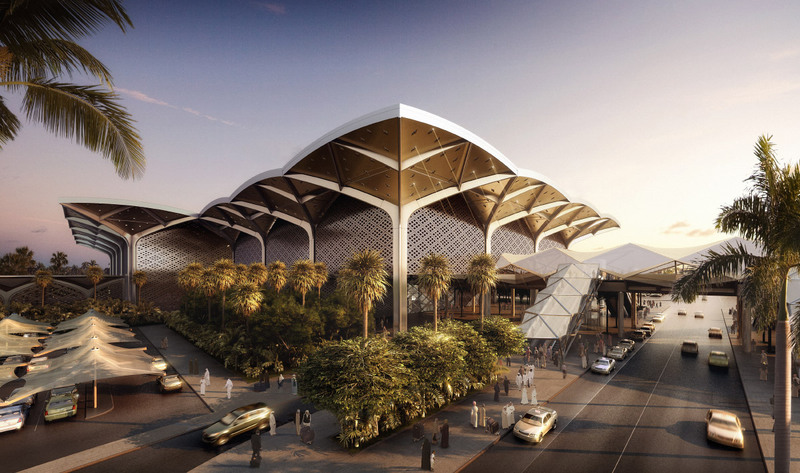 Once completed in a few years, the project will function as a gateway to the new multimodal King Abdul Aziz Road, a 2.27-mile-long spine of development connecting central Mecca with the country’s transportation network. The road will contain a 200-foot-wide promenade and will be surrounded by 100,000 residential units and 28,000 hotel rooms. Regardless of the reception, however, one thing is clear: In Saudi Arabia, the future is almost here, and it looks very, very big.